IntelliCell BioSciences has had a terrible year. Well, there’s terrible and then there’s terrible! For background, I detailed its troubles, ups, and downs here in a previous post. I was just working on a new draft post on the most recent, concerning FDA 483 report on the company, which I will release soon (it was released to me by the FDA last week) in a new post coming up, when I heard the news that reportedly the company is in foreclosure or at least is having some kind of foreclosure sale. 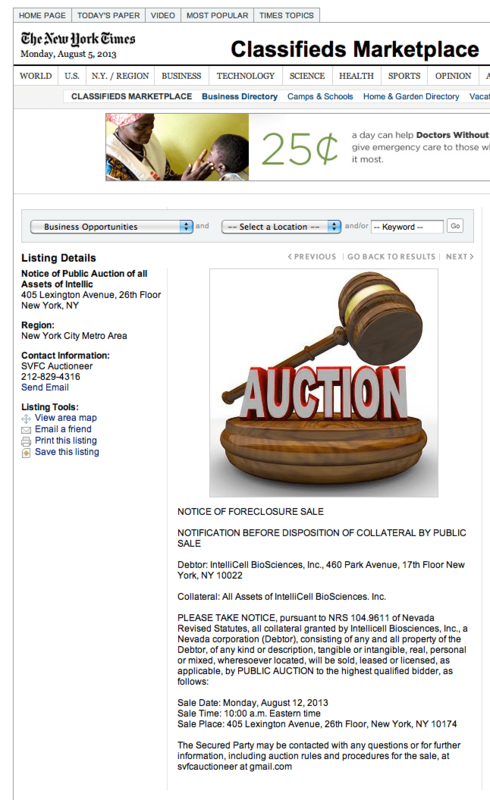 The Foreclosure Sale Announcement, posted in the NYT online classified ads, is shown above in a screenshot (note that after clicking that link that you need to chose “business opportunities” and then pick the location as NY Metro Area. The IntelliCell auction announcement should then pop up. Is this the end of the line more broadly for the company? If so, keep in mind this is still, in theory at least, a publicly traded company. What happens to stock holders? If this is not the end of the road, and the company continues to survive, what does this sobering event mean for its future? Intellicell Inspected By FDA: What Does It Mean? Please contact me. Dr. Lowe at the Amen clinic just recommended Dr. Victor to treat my son who has autism. The comments below should be taken with the knowledge that there is a conflict of interest. Cell-Innovations has filed patents on ultrasonic cavitation. Cell-Innovations bought the rights previously from Intellicell for the use of their patent in Australia and New Zealand recognising the potential value of this technology . Upon utilizing the technology in our own hands we discovered that the Intellicell process heats the adipose tissue to over 100 degrees Celsius – causing massive cell death. The temperature obtained can easily be seen by following the procedure of intellicell’s patent now that it is released. The Millipore results produced by Intellicell to show viability are all correct – but if you use the wrong tool you obtain the wrong result as cell death is complex process. Subsequent to our findings we have developed and filed a number of patents utilizing ultrasonic cavitation correctly to derive viable SVF from adipose. Thanks for the comment, Wayne. I’m not sure I understand some points though. So you found the ultrasonic cavitation process used by IntelliCell basically cooked all the cells to death in your hands, correct? But am I understanding correctly that in the “Millipore results” by IntelliCell, cells were not killed and remained viable? In this case, what is the wrong tool and what is the right tool? Yes – their ultrasonic cavitation process basically cooks the cells resulting in no MSC cell growth. If you measure by the Millipore agent immediately you obtain a reading of viable cells. If you place in culture over a number of days all the cells die. The process has been flawed from the start. Determining an easy ‘right’ tool has been a difficult question for us to answer. The only we have been able to assure ourselves what we see by viability stains is correct has been by culturing each sample as we worked on the methodology. We have treated over 300 patients with positive clinical results and have done flow cytometry, CD antibody studies, Aminis studies all showing cell counts and cell viability. We have grown cartilage, mucous membrane, bone, heart muscle etc etc so if Wayne is right about dead cells then how does he explain our flow cytometry results and clinical results. Second yes we licensed to him and yes we have US patent granted and Australian patent final pending so his patents will never get granted. And if he has a secret why is so secretive? IntelliCell Facing Corporate Mortality or Can it Pull a Phoenix Act to regenerate itself?